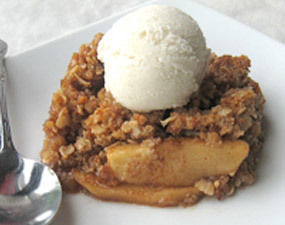 For a new twist on an old autumn favorite, try this not-too-sweet, not-too-tart apple crisp with toasted, buttery, gluten-free bread crumbs in the topping. Hands-on time: 25 to 30 mins. 1) Pulse some gluten-free bread (approximately 1/2 loaf, depending on loaf size) in your food processor and set 3 1/2 cups of the crumbs aside for the topping. 2) To make the filling: Peel, core, and slice about 6 apples; the variety is your choice. 3) Combine the boiled cider and orange juice, and toss with the apples. 4) Combine the cinnamon, nutmeg, granulated sugar, and a pinch of salt. To thicken the filling, add 1 tablespoon gluten-free tapioca starch. Toss the apples with the sugar/spice mixture to coat, and spread in an 8″ square pan. 5) To make the topping: Mix 3 cups of the bread crumbs, the oats, brown sugar, cinnamon, and a pinch of salt. Pour the melted butter over the mixture and stir, allowing the bread crumbs to absorb the butter. 6) Press the topping evenly over the apples and bake in a preheated 350°F oven for 20 to 25 minutes, or until the topping is golden and the apple filling is bubbling. 7) Remove from the oven, and serve warm; ice cream or whipped cream are a tasty topping.